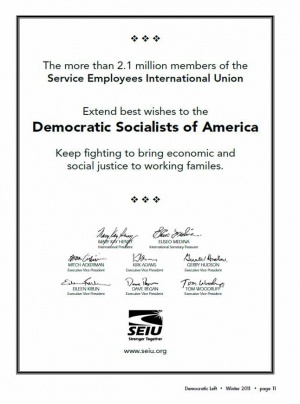 Gerald (Gerry) Hudson is a socialist and an an executive vice president of Service Employees International Union (SEIU), since 2004. He heads the union’s Long Term Care Division, representing nearly 500,000 nursing home and home care workers nationwide. He came to SEIU in 1978 from the Hebrew Home for the Aged in Riverdale, N.Y., where he was a member of SEIU Local 144. Hudson coordinated the merger of Local 144 into SEIU/1199 and was elected as executive vice president for the former-District 1199 in 1989. Hudson founded the 1199 School for Social Change - a former alternative school in the Bronx and served as a trustee of the Local 1199 Training and Upgrading Fund, Home Care Workers Benefit Fund, and Michelson Education Fund. I came to DSA (it was DSOC back then) in the 1970s as a young labor activist working in an 1199 nursing home. I joined DSA precisely because of Mike Harrington’s vision of a non-sectarian, majoritarian left, with the labor movement at its core. And I joined because, as Michael used to say, good is not the enemy of perfect. He believed–as I do–that incremental change is vital if we are ever going to achieve power for working people. As democratic socialists we don’t believe in the big bang of revolution, but rather in the gradual struggle that is sustained over generations and that has real impact on people’s daily lives. As at May, 1987, Hudson (then known as Gerald Hudson) worked alongside Joanne Barkan, Vania Del Borgo, Maxine Phillips and Jan Rosenberg for the Editorial Committee of the Democratic Left Magazine, the publication of the Democratic Socialists of America. In March 1998 “Endorsers of the Call” to found a Black Radical Congress included Gerry Hudson, Executive Vice President, Local 1199 — National Health & Human Services Union, New York City. Gerry Hudson also has had an extensive career in Democratic Party politics. Hudson led the presidential campaign of Jesse Jackson in New York and the successful New York City mayoral campaign of David Dinkins, he also served as deputy director of the Mario Cuomo for Governor campaign in 1994. While Cuomo himself was not re-elected governor, Hudson's leadership was instrumental in electing H. Carl McCall, the first African American controller in New York state. 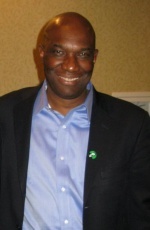 In 1996, Hudson served as political director of the New York state Democratic Party. With our country poised for massive, progressive change, we finally have the chance to build a broad democratic left majority with labor at its core. But to do that, we have to be bold and creative, not stick to outmoded ideas, and we must challenge even some of our most fundamental ideas so that we can grow a labor movement that has shrunk precipitously in the last decades. We are, as Michael Harrington wrote so clairvoyantly more than forty years ago, a labor-oriented civil rights movement, not just a union. To that end, we look forward to others on the democratic left joining us in our struggle. Gerry Hudson serves on the boardof the Apollo Alliance. 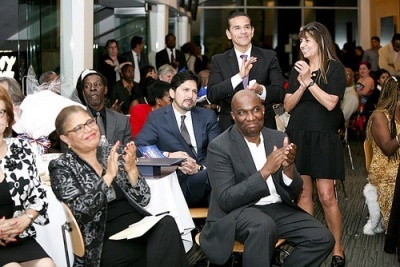 As a long-time champion of environmental justice, Hudson has served on the board for Redefining Progress, the nation’s leading public policy think tank dedicated to developing innovative public policies that balance economic well-being, environmental preservation and social justice. He also participated in the first-ever U.S. labor delegation to the United Nations’ climate change meeting in Bali in 2007. In 2006, Gerry Hudson, served on the National Advisory Board of the Apollo Alliance. In 2009 Gerry Hudson, Executive Vice President of 1199/SEIU served on the Advisory board of the Center for the Study of Working Class Life. Gerry Hudson is a past recipient of Asian Americans for Equality's annual Dream of Equality award. Maria Svart, Gerry Hudson, Mark Levinson and Skip Roberts attended the 2012 Socialist International Congress in Cape Town South Africa. The 57th Debs ­ Thomas ­ Harrington Dinner convened on May 8 2015, at the Crowne Plaza Chicago Metro on Chicago's near westside. It was a dark and stormy evening but an educational and inspiring event. April Verrett presented the award to Gerry Hudson speaking on "what Hudson means to me": Never shrink from leadership. Hudson reflected on being a "baby socialist" while on the National Committee of the Democratic Socialist Organizing Committee's Youth Section, and how DSA and SEIU provided him with a political education and a pro-social outlet for his rage at injustice. This page was last modified on 5 February 2019, at 02:06.